This bouquet is a classic floral gift for any occasion. 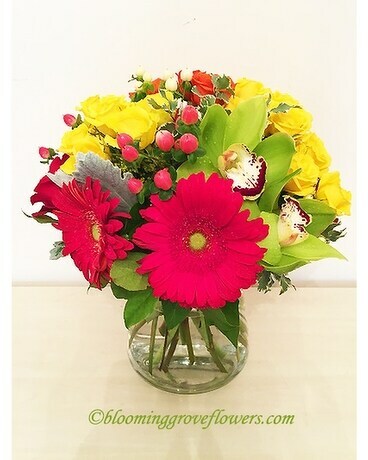 Yellow and red roses, green Cymbidium orchids, red miniature gerberas, hypericum, all surrounded by lush greenery, are delivered in a clear glass vase. Approximately 9" W x 12" H. Orientation all-around. Flowers and Containers subject to change based on season and availability. However we will create something similar. Please call to discuss.